It’s time to upgrade your gas-powered string trimmer to something better. Forget the hassle of dealing with noise, fumes, refueling, and engine maintenance. We want to help you find the best battery-powered weed eater for your yard. What safety equipment is necessary when you use a string trimmer? Today’s battery-operated string trimmers give you the freedom to roam. Moreover, in many cases, they offer power equivalent to gas models. But they cost less to use in the long run. Plus, they make less noise and pollute less, too. This 12-inch trimmer from Worx runs on a 20V lithium battery for about 40 minutes on one charge. But it comes with a second battery, so you don’t have to interrupt your work. Either battery charges in about three hours. The two-in-one function means that the trimmer instantly converts to an edger once you pull and rotate the trimmer head and lock it into place. Next, the tool only weighs 5.3 pounds. Plus, it has a telescopic shaft to adjust to different users. While you work, the handle has seven positions for comfort. And the adjustable guard protects flowerbeds from unintentional damage. Finally, the instant feed means you don’t need to bump to extend the line. BLACK+DECKER’s LCC221 trimmer comes in a kit with a blower. Both tools run on a 20V Max lithium-ion battery. Although this weed eater is best suited to a small yard, it weighs only 4.5 pounds. Moreover, it’s covered by a two-year limited warranty. BLACK+DECKER’s LSTE523 string trimmer converts to an edger with a guide wheel. The cutting width is 12 inches. It has two speeds and a button that advances the line. It runs on a 20V Max lithium-ion battery, the same kind that powers other tools in their lineup. The WORX GT2.0 weed eater is a 12-inch mini-mower and edger, too. It uses a 32V lithium battery for up to 35 minutes of runtime. And you don’t need any tools to convert between functions. WORX includes three extra spools that are preloaded with line, support wheels and a safety guard. The in-line wheels serve as a guide for edging and support the mower function. Next, the safety guard protects low hanging branches and flowers from accidental damage. Also, both the trimmer and edger have single line feed, so there’s no need for bumping. Of course, the handle is adjustable. And the tool is covered by a 30-day money-back guarantee and a three-year warranty. The 13-inch WG191 trimmer offers more power with a 56 V lithium-ion battery that runs up to 90 minutes on a charge. WORX describes it as having “gas-like performance with zero emissions”. Not only is there variable speed control, but there’s also a battery indicator. The tool converts between trimmer and edger in seconds. Then the removable twin wheels make it easy to clean up edges. Furthermore, you can electronically advance the feed the push of a button. The quick-change spools take just a moment to replace. Plus, the WG191 uses the thicker trimmer line that professional landscapers use. Greenworks sells the 13-inch convertible edger and trimmer for smaller lawns. Its brushless motor runs up to half an hour on a charge. The tool itself weighs 9.3 pounds. Additionally, it uses 0.065-inch single line with automatic feed. The 14-inch Greenworks cordless string trimmer also only runs for half an hour, but it has a few advantages over the smaller model above. That’s because it offers a professional-grade experience. It uses the thicker 0.080 line in a dual configuration. And it has bump feed for maximum control. Next, the trimmer is covered by a four-year warranty and the battery by a two-year warranty. But the brushless motor itself is protected by a 10-year warranty. Famed power tool maker DeWalt makes this string trimmer that sports a brushless motor powered by a 20V 5.0AH lithium-ion battery. Those are the same battery packs used by many of their power tools. The trimmer has a 13-inch cutting path and bump feed. Moreover, it uses 0.080 line. Compared to other brands with this much power, the DCST920P1 is surprisingly lightweight at only 8.5 pounds. Its trigger controls the variable speed between 4600 and 6000rpm. And it has high and low gears to maximize battery life. In conclusion, it’s protected against defects by a three-year limited warranty. DEWALT’s DCST990H1 string trimmer steps up in power with a 40V battery and a longer run time. This weed eater is marketed to pros. The 15-inch cutting swath finishes the job faster. The bump feed and variable speed trigger give you maximum control. And the trimmer is built for durability and long life with impact-resistant housing. Husqvarna’s 115iL grass trimmer has a 14-inch cut path. If you only have a little weed whacking to do, you can switch it to “save mode” and extend the runtime. The brushless motor makes efficient use of a 40V battery. Customers comment that the weed eater feels lightweight and well-balanced. It weighs 8.9 pounds and has a telescopic shaft and padded handle that reduces vibrations. Milwaukee powers the 2725-21HD string trimmer with their M18 FUEL battery packs. If you’re already the owner of other cordless Milwaukee power tools, you can share batteries. Plus, the included battery runs up to an hour on a charge. This weed eater has a professional-grade design that accommodates both 0.080 and 0.095 lines. You can adjust its cutting swath between 14 and 16 inches. Additionally, it reaches full power in one second and has variable speed control by the trigger. EGO POWER+ presents the ST1502SF, a powerful weed eater with a 15-inch cut path. It has a brushless motor that gets the most from a 56V arc lithium battery. One customer commented that they can edge and trim their entire quarter acre lot on a charge. You’ll waste less time replacing line because this trimmer uses 0.095-inch professional-grade string. You can advance it with a bump. Also, the weed eater fights off fatigue because it weighs less than 12 pounds and has very little vibration. 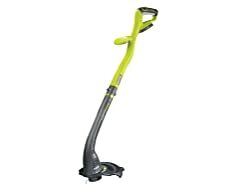 Ryobi’s sleek string trimmer weighs only 4.5 pounds. It’s very lightweight and maneuverable for practically any user. The 10-inch cut path is best for small yards. But the weed eater quickly converts to an edger. Best of all, the tool runs on either lithium-ion or ni-cad 18V batteries used by other Ryobi tools. The Makita XRU02Z string trimmer spins the line faster than most competing models. It reaches speeds up to 7800 RPM. But it runs on the same 18V lithium-ion battery packs that other Makita power tools use. Even with the battery onboard, the trimmer weighs only 6.4 pounds. Although it’s compact, you can adjust its length between 48 ½ to 56 ½ inches. And once you rotate the head, you’ll switch from trimmer to edger with a 10.25-inch cutting width. VonHaus endeavors to make grass trimming easy with their 40V weed whacker. It has a 9.8-inch cutting path, and its head adjusts to a 90° angle for edging. Moreover, the tool weighs 10 pounds and comes with a safety guard. One of the biggest frustrations about using a string trimmer is that the line tends to break at inopportune moments. One of the easiest ways to prevent this problem is to check the area you want to trim. Get rid of rocks and debris. And don’t try to tackle brush that’s too thick for the weed eater to handle. Next, ease the head into the area you wish to trim. Start from the edge and work your way in slowly. The tip is more effective at cutting. Objects that will quickly snap the line include curbs and edges of buildings, the pavement, or other hard obstacles. Come at these items from the side instead of making a frontal assault. A string trimmer can turn small objects into missiles that can break windows. That’s why it’s always smart to wear protective gear. Protective gear includes long pants, sturdy closed-toe shoes, gloves, and safety glasses. When you use a battery-powered weed eater, it’s unlikely that you’ll need hearing protection. Also, it’s not a bad idea to make sure pets and children are far away from the zone where you’ll be working. Finally, make use of the safety guard to protect low-hanging branches and delicate flowers. The guard can also deflect flying debris. How big is your yard? Will the battery last long enough to complete the job? Will you want two battery packs to avoid delays? How heavy of a tool can you manage for as long as it takes to finish trimming? If you’re above average height, does the handle adjust to accommodate you? What size of line does it use, and how hard is it to find replacements? Does the trimmer come with a warranty? You might also want to consider whether the trimmer runs on the same battery packs that your other cordless power tools use. That fact can save you a substantial amount of money because you can purchase a bare tool. We hope you discovered the ideal battery powered weed eater today. This type of tool manicures your yard without digging deep into your budget. To help you find the most suitable model, we covered the best string trimmers of various sizes. While some are both trimmers and edgers, others are even more versatile.